The appetite in the United States for thrillers written abroad has yet to reach its saturation point, if such a thing exists. So it is that BUDAPEST NOIR, written by Vilmos Kondor and translated by Paul Olchvary, should be grandly welcomed by American aficionados of detective fiction. First published in Hungary in 2008, this is the first of what is presently a series of four novels featuring a newspaper reporter/editor named Zsigmond Gordon. Seemingly known everywhere he goes in Budapest and greeted with the title “Mr. Editor,” Gordon is part Clark Kent, part Sherlock Holmes, combining an instinct for news with powers of deduction and a knack for righting wrongs in unconventional ways. "Gordon is a smart and likable protagonist, and his grandfather, though a secondary character, is an entertaining one who inadvertently provides some occasional low-key suspense due to his unpredictability." 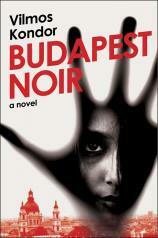 BUDAPEST NOIR and its successors have been greeted with great critical and commercial acclaim in Hungary, possibly due as much to the historical settings of the books as to Gordon’s talent for solving crimes. The novel is set in the mid-1930s, just as Hitler appears poised to swallow Hungary whole while the country itself seems willing to jump into his jaws voluntarily. Accordingly, a grim but vague uneasiness settles over most of the book; it is not a political thriller per se, though what occurs is influenced to some extent by the times. So it is that Gordon, due to his contacts within the police department, is tipped to a murder scene where a young Jewish woman has been found beaten to death. The tragedy is compounded by the discovery that she was three months pregnant at the time. The location of the crime scene and a couple of other extremely interesting elements indicate that the victim was a prostitute. Gordon is bothered by a number of things, including the fact that the local police department does not seem to be too interested in investigating the crime. He is also intrigued by the issue of how the young woman reached the point in her life where she met her violent end. He begins an investigation of his own, one that is interrupted, though by no means derailed, by a series of none-too-subtle warnings. But Gordon is not set off by threats; he simply becomes more dedicated to his investigation, though more careful as well. Aided by his somewhat edgy girlfriend and his eccentric but nonetheless brilliant grandfather, Gordon follows a meandering and seemingly impenetrable trail of evidence to a rather shocking conclusion. Bear in mind that it’s not the ultimate resolution of the mystery that’s the point of the book; rather, it’s the manner in which Gordon imposes a rough, pointed and ultimately satisfying justice upon those responsible for the victim’s death. American audiences may find BUDAPEST NOIR to be a bit of a rough slog in spots due to Kondor’s attention to historical detail, particularly with respect to the line of succession of governmental leaders that form the backdrop of the story. My best advice is to tiptoe through this and stick with the narrative, which is first rate. Gordon is a smart and likable protagonist, and his grandfather, though a secondary character, is an entertaining one who inadvertently provides some occasional low-key suspense due to his unpredictability. Here’s hoping that the volumes published to date become available in the United States sooner rather than later.